149 photographers spanning 25 countries participated in the seventh edition of the Mirabaud Yacht Racing Image. Jean-Marie Liot, from France, won the main award, whilst the delegates from the Yacht Racing Forum and World Sailing’s annual conference chose Nico Martinez's photograph for the Yacht Racing Forum award. Christophe Huchet won the public award, based on the votes on Facebook. The top 80 pictures can be viewed on the website. Malta, November 29, 2016 - No less than 149 professional photographers spanning twenty-five nations submitted a picture for the Mirabaud Yacht Racing Image 2016 and generated an exceptional selection of images that summarize the yacht racing season better than words. French photographer Jean-Marie Liot won the main award thanks to an extraordinary picture of Morgan Lagravière training ahead of the Vendée Globe onboard his IMOCA Safran, entirely submerged by a wave at high speed.
" When I took this picture, I immediately knew I would send it to the Mirabaud Yacht Racing Image award ", says Jean-Marie. " The conditions were perfect and Morgan was pushing hard. I am very happy to win this contest, because it reassembles the best yacht racing photographers and the jury is made of professionals from within the yacht racing industry. It’s a real achievement. " Based in Vannes, in Brittany, Jean-Marie Liot has been working as a professional yacht racing photographer since 1994. His assignments allow him to travel around the world, working for many skippers, sponsors and races and collaborating with the greatest yacht racing magazines.
" I never realised how hard judging a competition like this would be ", said Ian Walker, winner of the Volvo Ocean Race and a member of the Jury. " There are so many wonderful shots, each with their own beautiful story to tell. If ever there was a competition that didn’t deserve to have winners and losers then this was it! It was a privilege to be able to study these wonderful photos from so many talented photographers." " The savage beauty of Jean-Marie’s stunning white welter of water was a stand-out choice in an exceptional field of entries. It speaks volumes about personal courage, vast technological growth, sailing skill and performance", said yachting journalist and writer Keith Taylor. 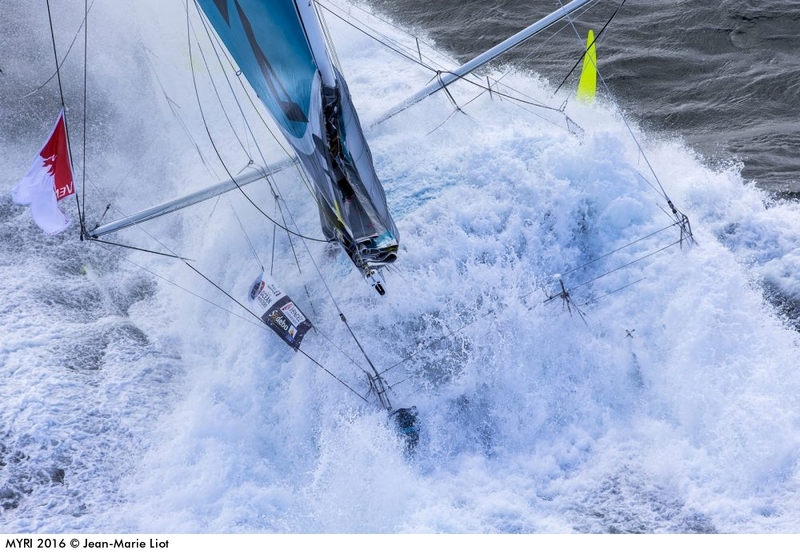 Also a member of the jury, Christian Février said: " Jean-Marie Liot’s picture of a fully immersed racing boat is rare. Despite the help offered by the chopper - stability, angle of the shot, context, situation… - this image is very impressive. " " Most people don´t think about all the hard work that lays behind each photography. I do. I have so much respect for all the contributors in this years competition. As much as I enjoyed looking at the photographies It was a difficult task to make a judgement but I´m very pleased with the result in the end ", added Anna-Lena Elled, picture editor at Searchmagasine. Nico Martinez won the Yacht Racing Forum award, chosen by the delegates from both World Sailing’s annual conference in Barcelona in November and the Yacht Racing Forum. Christophe Huchet (FRA) won the public award, selected by the number of votes on Internet. No less than 34’680 votes have been taken into account, whilst 1,8 million pages have been viewed on the event’s website.